Slightly muddled, but its a muddle of beautiful scenes and spectacular combat set in a breathtaking place. When I finished BioShock Infinite – don't worry, I won't spoil anything – I was dumbfounded. I wanted to tell someone what I thought, but for a moment I had absolutely no idea. I'd experienced a kind of excited panic, then total delight, then momentary confusion, and then a rush of extraordinary sights, powerful scenes and sudden twists that left me struggling to keep up. It's a spectacular ending. It's just a shame it doesn't make a lick of sense. "The plot really does jump the shark. It jumps a lot of sharks. It jumps BioShark Infinisharks"
Infinite is wonderful. Every single person who can play it, should play it. It's a fascinating and gruesomely fun adventure in a genuinely unique, magnificent place. But the plot really does jump the shark. It jumps a lot of sharks. It jumps BioShark Infinisharks. That's not uncommon in cinematic first-person shooters, but I mention it now because the game's mysteries are such a big part of its appeal. You're on a flying city of magical racists in 1912, and that soon drops to being only the fifth or sixth most puzzling thing about your situation. Who are those two? Why are they talking about me? What's with the giant cyborg bird? What does AD stand for? How does he know... why does she think... when did they... why can I shoot crows from my hands? And how do these pants help me reload? The intro says you're Booker DeWitt, a private investigator tasked with retrieving a girl named Elizabeth. But I played more like a crazed amnesiac looter, scouring the city for spare change and story clues. 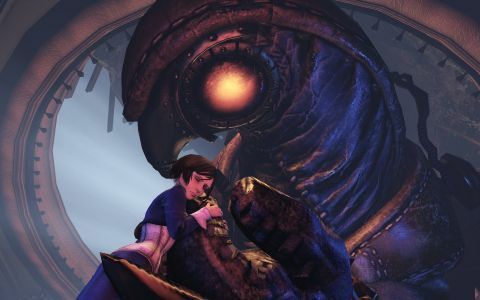 In cheerful contrast to the original BioShock's deep-sea madhouse, the flying city of Columbia is still thriving, still beautiful, and still populated – albeit with magical racists. That means it can give you little pieces of these puzzles in more interesting ways, and hoovering them up into a wonky jigsaw is a joy. "You get to know Columbia as a tourist: a dazzling dream of an impossible city in an impossible place – tranquil, prosperous and happy." I think it still would have been, even if a tear had opened in the fabric of spacetime and future alterno-Tom, stroking his goatee, had told me that the plot ultimately doesn't add up. So I'm telling you in the hope that you'll still enjoy the process of assembling that wonky jigsaw, without being quite so disappointed when the game itself cuts all the nobbly bits of the pieces so it can cram them together the way it wants to. Really, it's just a pleasure to have a game this substantial to explore – and one that gives you the breathing room to do so. You still spend a lot of time killing things in BioShock Infinite, but it knows when to give you space. You get to know Columbia as a tourist: a dazzling dream of an impossible city in an impossible place – tranquil, prosperous and happy. Shops, blocks and districts waft wonkily through the air, listing as they cruise in to dock with each other. Bells chime, children play, locals picnic. There's a fair on, and everyone's out in their 1912 Sunday best. The sun is dazzling, the views are breathtaking, and everyone you meet is chattering happily. As heavy metal clamps lock a tailor's shop in place, I realise the times on the sign outside aren't their opening hours: they're arrivals and departure times. Your arrival is one of gaming's few truly perfect scenes: a chapel, floors awash with holy water, stone walls echoing with the calming harmony of a gospel choir. Stained glass dioramas flood the space with brilliant gold light, and the heat from a hundred candles creates a gentle haze. The only hint that you're not actually in the afterlife is an occasional, very distant clanking, as some chunk of the city drifts against its restraints. It's more than atmospheric; it's exquisite. That kind of ridiculous artistic flair runs throughout: staggering works of sculpture, transformative use of light, perfectly judged ambience, and music that both nods to the plot and subtly changes the mood. The mileage this game gets out of the song Will The Circle Be Unbroken alone – all four times it's used – deserves some kind of award. "Your arrival is one of gaming's few truly perfect scenes"
Columbia is a less restrictive setting than BioShock's Rapture, and each district has a different vibe. That makes your adventure through it fascinating, and each new area exciting to discover. Even close to the end, you're visiting remarkable new places with radically different moods. I keep wanting to say that it's 'directed' brilliantly, the elements fit together so well. But that's not the right word, because the other thing it does well is keeping you in control. There are no cutscenes, no switching to third person, no agency-limiting tropes like mounted gun sections. The few times you're not free to move are generally when your character physically wouldn't be. Maintaining that respect for the player, even when you need to tell a character-driven story, is a rare and wonderful thing. Like Half-Life 2, Infinite doesn't feel like a game made by frustrated filmmakers. It feels like a game made by people who know how to make films, and decided to make something else. Early on, the times when combat does break out are the low points. There seems to have been some internal rule against adding any exotic weapons, so Infinite's guns stick religiously to convention: pistols, shotguns, three types of machinegun, rifles, grenade launchers and a rocket launcher. None of them let you choose an ammo type the way BioShock did, and only the revolver and shotguns are really satisfying to use. Those aren't available in the early fights, when guns are your primary tools. It gets better the more you drink. You acquire magical abilities by downing Vigors, which come in beautiful custom bottles relating to what they do. A lot of the early ones just let you disable and damage a group of enemies – by swarming them with crows, setting fire to them, or floating them into the air. But they get more interesting. "There seems to have been some internal rule against adding any exotic weapons, so Infinite's guns stick religiously to convention"
Charge lets you dash to a group of enemies and hit them with explosive force. Return to Sender absorbs incoming damage while you hold the button, then releases it as a projectile when you let go. Undertow can knock enemies back with a wave of water – often the end of your day, in a flying city. Or you can hold the button down to reach out with Donnie Darko-style tendrils and yank distant snipers to your doorstep. The water even holds them still while you line up a headshot. Some of them form natural combos: soaking wet Undertow victims are really hoping that you're not going to- oh, you're electrocuting them before they can get up, classy. Enemies currently being pecked to death would like to request that you don't set the crows... well, they're on fire now, but for future reference. There are only eight Vigors, and they're all free when you find them. You only specialise when you buy upgrades: expensive but significant perks for each, some of which introduce new rules. I wasn't wild about Murder of Crows until I bought the perk that creates a nest every time someone dies during the pecking process. If anyone steps on it, that nest erupts in a new flock of crows. If anyone dies during that crow storm, you get new nests! Plenty of fights involve new waves of enemies flooding into the same area, and this self-perpetuating cycle of flapping and screaming and dying is a guilty pleasure. You can tweak your abilities a little more with Gear – like the aforementioned pants that mysteriously help you reload. I also carry three magical hats, two spare shirts, a spare pair of shoes, and I've now upgraded to pants that make me explode when I land from a great height. The system is insane and wildly incongruous, but it does allow for some entertaining configurations. If someone walks into one of my crow traps, I can then land on them to set the crows ablaze. If they try to hit me, my hat electrocutes them. And by then they've taken enough damage that my shirt will let me break their neck with one blow. This causes my shoes to heal me, as a reward for getting a melee kill. "I'm wearing pants that make me explode when I land from a great height." Vigors are very similar to BioShock's Plasmids, of course, and Gear is the new version of its Tonics. Alone, they're not enough to make Infinite's combat much better than BioShock's. But it is, and for a different reason: space. The game's biggest fights take place in huge open areas, sometimes several city blocks, and metal Sky Rails snake through the air between them. These rails are inverted rollercoasters: you hold a magnetic wheel gizmo that lets you dangle from them, then ride their curves with improbable speed. This changes the format of combat completely: instead of ducking behind cover when you're in trouble, you leap up and ride off, too fast to be hit. As you zoom along you can aim for a landing spot, pounce on an enemy, switch to a different rail or – best of all – leap onto a hoverboat. These boats swoop in at the start of a fight, touring the combat space before settling on a spot from which to pelt you with rockets. If you've got the sea legs for it, you can leap onto one of them as it's cruising around, smash all its troops off, then jump off when it drifts near enough to another Sky Rail. The battlefield itself is in motion. The final new element in Infinite's fights relates to Elizabeth, the woman you're here for. She can open 'tears' in space that lead to alternate universes. In combat, those universes seem to be full of heavy weapons, medkits, and turrets that are mysteriously on your side. She can only do it at predefined points: you see a ghostly image of the various things she can bring in at different spots, and you press 'use' on one to order her to make it real. "If this isn't sounding contrived yet, I'm not explaining it properly." If this isn't sounding contrived yet, I'm not explaining it properly. These tears are the very heavy hand of the level designer offering you a menu of choices, and they often make the fights feel staged. You can only open one at a time, but that decision is almost always an easy call: of course you want the turret. When you need health, opening the medkit tear is just one more press of the 'use' key, then you can bring the turret back. These things might as well be part of the level. Elizabeth herself is nice. I liked her. If you were hoping for something more – perhaps even the fabled Strong Female Character™ – you might be disappointed. When you're together, she's relegated to the role of caddy, limited to passing you a new weapon when you run out of ammo, and only ever using her own abilities when you command her to. And when you're separated, the plot repeatedly underscores how helpless she is without you. Again, this is not unusual in videogames, it's just that the sublime introduction to Infinite's story led you to expect more from it. You do have a handful of really lovely character moments with her. But the few times that she does something of her own free will, the significance of the act is undermined by the plot's broken logic, and so is the chance of building a more interesting relationship. It's awkward: I want to tell you why the plot failed for me, but I have to be vague. It has many, many leaps of questionable logic, but the ones that really hurt are when your terrible predicament seems to be the direct consequence of decisions that didn't make sense at the time. "your solution to a simple logistical problem is the equivalent of setting off an atom bomb to clear a cobweb"
You don't set off an atom bomb. That was a metaphor. The worst culprit is the ending. The plot's final emotional sting is an action that just doesn't seem like it would achieve anything. It seems to be assuming some new rule about how this world works – but since those rules were never established, any drama that hinges on them feels arbitrary. That completely deflates the ending's potentially enormous impact. And not just for me: two other reviewers and I discussed it at length, trying to come up with a compelling version of the logic, and none of us could find one. In a sense, that beauty makes it even more of a shame that the writing doesn't manage to put all this spectacular work to better use. But it also means that these moments end up being emotional anyway. It's like a surreal arthouse movie where nothing really makes sense, but where each scene is strangely compelling nonetheless. It's a weird note to end on, after a game that's so magnificent in so many other ways. But it doesn't change the conclusion: BioShock Infinite is something extraordinary, and no one should miss it. I cover the techy and practical side of the PC version specifically in a separate article on the PC version of BioShock Infinite - performance, FoV, 1999 Mode and the rest.